You're Healed. Now Walk Like It. These words from the story of Jesus healing the paralytic man at the pool of Bethesda in John chapter 5, rattle around in my brain. This man Jesus made well had been an invalid for thirty-eight years. At the point of their interaction, he had been suffering since before the Messiah he was speaking to was even born. He sat alongside the healing pool in hopes of being cured by the waters. The first person to get into the water after it was supernaturally stirred would be the one to receive healing. "This story doesn't make sense," I'd often think. It confused me for years. "Was there no one, after all those years of seeing him waiting by the pool, who would help him in when the time came? What is wrong with people? If not, why didn't he just ask someone? Why didn't they form a line or draw numbers so they'd know who was next?" I never saw it as the man's or anyone's fault, per se. But I realize now that the point of this story isn't about fault. It's more of a circumstance, I guess. Sometimes I read too much into things searching for a lesson to be learned. The point of the story is Jesus. 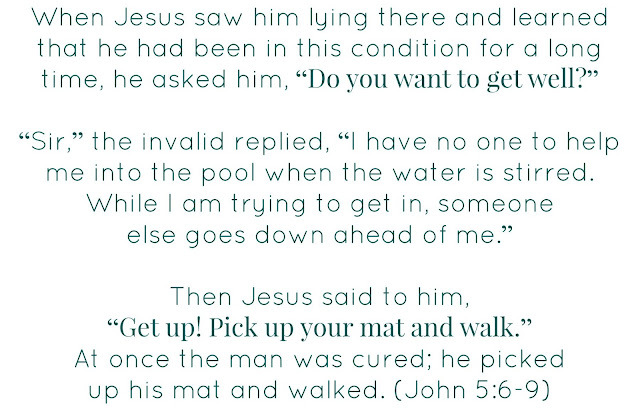 Jesus wasn't saying, "Get up, I'll help you miraculously get into the pool." He said, "Get up and walk." You're healed, now walk like it. The man had no idea who Jesus was. (v. 13) So it wasn't like he had a giant faith leading to his healing. In fact, he had no faith at all. But Jesus did it anyways. He released healing power into someone who had absolutely zero faith in Him. Huh. Jesus is not limited by your faith or my faith. The releasing of His power is not dependent on you or I. This is good for me to ponder. He does move in response to our prayers. But not always. We don't always ask in accordance to His will. 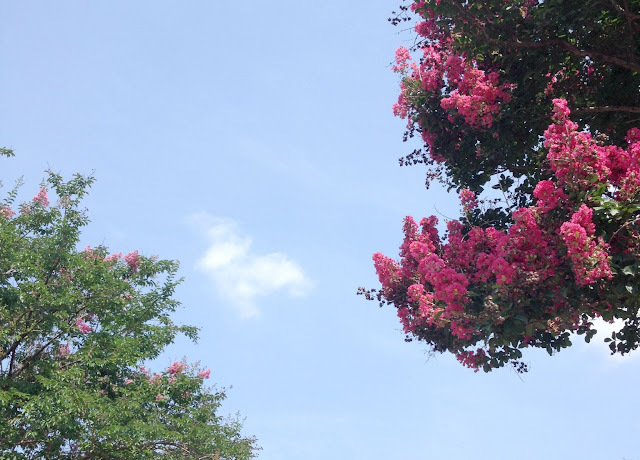 Sometimes I think, "If I just had enough faith, this health issue would disappear or that friendship would be resurrected." But not here. No faith was required. So this leads me to look more closely at the words of Jesus after He heals the man. Key words are spoken when Jesus tells the man to get up and walk, and the man does. He doesn't argue, "Walk? Yeah, rrrright. There's no way." The man simply gets up and starts walking. He's been healed! This has me thinking about us. We've been healed too. If we're in Christ, we've been healed spiritually right down into depths of our souls. Some of us have been healed on the outside too. In the form of physical bodily healing. 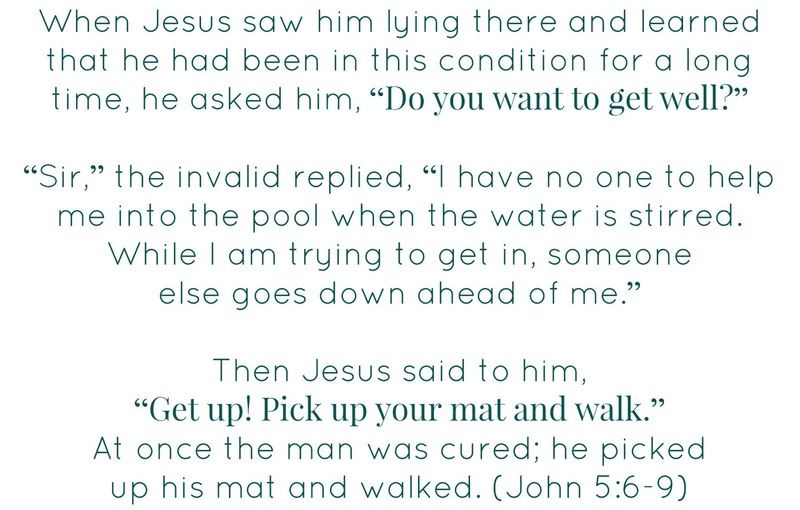 In either case, Jesus would never have us stay sitting by the pool resisting His call to us to get up and walk once we've been healed. But sometimes we do. I still baffle myself with the ways I'm still sitting by the pool. 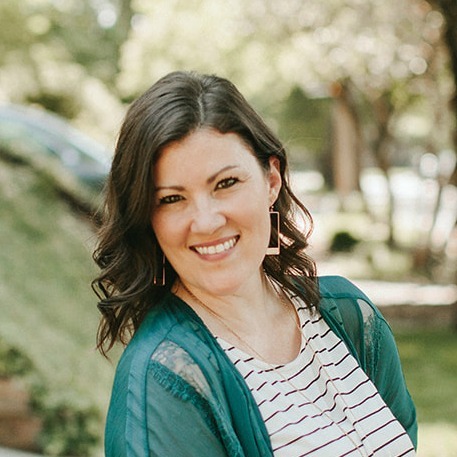 I hang onto bitterness Christ has already conquered. I cling to control as a means to keep everyone safe when Christ is our safety. I allow injustice to eat away at me when Christ brings ultimate justice. Tired and spent, I ask myself, "Amanda, do you want to get well?" Christ is calling us away from the pool. We've been healed. Let's walk like it.